New book, 64 pages, ELI195. 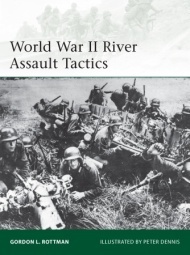 On the major European and Russian fronts throughout World War II, the challenge of crossing rivers and other water obstacles under fire was absolutely central to any advance. The Panzers that crossed the Meuse at Sedan in May 1940 cut the French Army in two; the Wehrmacht's ability to cross the great rivers of the western USSR was vital to the lightning advances of Operation Barbarossa in 1941, and in 1943-45 the Red Army had to drive the Germans back from a succession of river lines during their advance to the Reich, culminating in the Vistula and Oder lines; in Italy the Rapido formed a bloody moat for the Cassino defences; and after D-Day the milestones on the Western Allies' advances were the Seine, the Somme, the Moselle, and finally the Rhine. The initial (hopefully surprise) assault could be made by infantry in light assault boats, and over rudimentary improvised bridges. But World War II armies depended on heavy mechanized equipment, and even if a bridgehead was seized, it then had to be held for long enough for engineers to bring up and erect prefabricated bridges strong enough to carry the tanks and artillery without which the bridgehead was doomed. Some of the most savage fighting of the war took place around bridgeheads, and the Allies invested considerable resources in the development of equipment and tactics for contested river crossings. This book explains the methods and the means, and analyzes specific successes and failures. It features a wealth of wartime photos, particularly from German sources, and full-color plates illustrate tactical scenarios that bring the subject alive.